She’s lost her mind. This has been a grueling and desperate and frantic and furious pinball round of a campaign and Hillary has officially hit TILT. Every minute, every hour, every day as the remaining superdelegates trickle over to the Obama column, Hillary has reached deeper into her quiver for the remnants of the last few broken arrows that she can shoot or even just throw at the Obama campaign. She’s lain down with the worst of her and her husband’s enemies from the 1990s, she’s tepidly dismissed the possibility of Barack Obama being a Muslim (“as far as I know…”), she’s invoked the struggles at Selma and the Deep South of the 1950s in defending the right of the Michigan and Florida delegates to be seated at the convention–after she and her surrogates sided with the DNC Rules Committee that these delegates would in fact not be seated if they went against the strict orders of the party not to attempt to move their primaries up ahead of Super Tuesday–and even conflated the situation with the fraudulent elections in Zimbabwe. She invented a lie about being under fire in Bosnia and has, more times than most people have fingers, changed the metric of victory. She’s made it clear a long time ago that she’s going to win at any cost, and she’s continued to reiterate that determination every single day. Yes, he was assassinated in June in California. 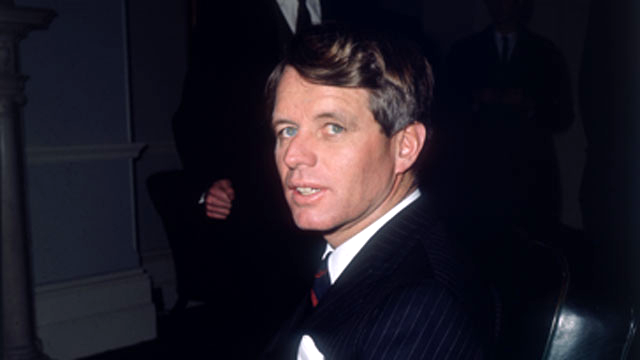 And we’re coming up on that horrible 40th anniversary–just after this week when RFK’s brother has been diagnosed with an inoperable brain tumor. Exhaustion and desperation notwithstanding, it’s astonishing that she would have evoked this gruesome imagery to justify her continued pursuit of the Presidency. This isn’t Mike Huckabee staying in a lost race wishing for “a Macaca moment.” Call it a befuddled moment at the end of a long campaign day at the end of a string of several hundred long campaign days, but as Keith Olbermann pointed out, this isn’t the first or the second or the third, but the fourth or fifth time since February that she’s alluded to the RFK assassination when she’s justified her staying in this race. Recognizing the stark reality of mortal limitations, as in the case of Senator John McCain, is one thing. Implying the possibility of political assassination as a reason to maintain your increasingly quixotic campaign is quite another. I don’t know what America that people like Sean Hannity are living in right now, but it isn’t the one where people live in fear every day of losing their jobs–even as their jobs are becoming almost prohibitively costly to go to with gas going up pennies a gallon every day. I have anemic health insurance and a fragile job, with no savings and no retirement, and I’m golden compared to tens of millions of my fellow Americans. Unlike a lot of elections in so many of our adult lives, this isn’t an academic exercise or a parlor game that we can hope for the best but dismiss the results if they’re the worst and move on with our lives, just because a megalomaniac with more guile, more ego, and more resources happens to win the day by the power of the personality and the damage they’re willing to exact on their opponent, even if it extends to the country at large. Now more than ever, this election is about the person who’s not only going to engage the Congress and the states and start helping to effect some real change, but it’s also about electing the person who isn’t going to poison the community well in trying to get there. Hillary has lost her marbles if it’s even lurking in the rearmost recesses of her mind that a political assassination would be regretful but okay, in the collateral damage sense, if it would get her the nomination. An assassination is a dagger in a nation’s soul, and to even evoke the possibility, no matter how inadvertent, casts a deservingly despicable light on he or she who uttered it. I’m sure that Hillary doesn’t wish that Obama would catch a bullet, but I’m also sure that she would welcome, no matter how regrettably, the advantage in her quest for her return to the White House that such a tragedy would afford her. She’s proven it already: Win at any cost, win at any cost, and win at any cost. Also, if in doubt, win at any cost. This is naked ambition that’s gone way past its sell-by date. We’ve gone well beyond pluck, and determination, and hard-nosed dedication to principle. She’s running on nothing but ego right now, and is queering the patch in the best shot the Democrats have had to win the Presidency since 1976 (despite his rock-star bonafides, her husband won in 1992 thanks in large part to H. Ross Perot, and Jimmy Carter wasn’t half the campaigner that Barack Obama is and very nearly lost that 1976 race to Gerald Ford). A desperate plea to the Clinton Campaign: You’re exhausted. You’re out of time and out of votes and out of money, and after your comments today, you’re out of dignity. It’s time to call it a night, Madame Senator. Thank you for your patience. The humor will return tomorrow night.